Racist bully UMNO AG Gani Patail and Malaysian Court not ready with Witness List but fixes speedy hearing date to fix up 21 Hindraf activists and disqualify them from contesting in forthcoming General Elections. 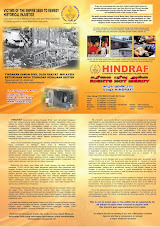 This morning 6/4/11, at the trial of the Hindraf 21 we saw how the KL Magistrate Zulkapli bin Abdullah as does almost all other Magistrates, Sessions Court Judges, ie., they all literally look to the DPP or Federal Counsel for ‘directions’ and for Hindraf lawyer P. Uthayakumar the Attorney general Tan Sri Gani Patail himself for “directions” and then make their decisions accordingly. In P. Uthayakumar’s Sedition charge in the immediate aftermath of the 25th November 2007 Hindraf Rally with the personal presence of the AG Gani Patail himself the K.L sessions Court imposed bail of RM 50,000 ie ten times the maximum fine of RM 5,000 plus his passport being impounded..
And today morning the Magistrate looked at the junior just out of college but wielding almost absolute DPP powers. When this DPP told the Magistrate that she had “arahan” (instructions) not to serve the documents on the lawyer but on the 21 accused directly the Magistrate delivered and executed AG Gani Patail’s “directions”. Incredible! This is just the tip of the iceberg on almost all Court proceedings especially against the UMNO government this is the Order of the day or how justice it has evolved today after 54 years of Independence. Interestingly, Murugan looks forward not to an outright aquittal, but to have his defence called so he has the opportunity to have his say in court. He wants to put on record the testimony of his witnesses; that on 25th November 2007 they had assembled peacefully in accordance to the Constitution, and in the true Gandhian Spirit and were never a threat to the nation or anyone else, least of all the Police!